Grapples and Oranges – Page 2 – A blog dedicated to Jiu Jitsu and Muay Thai and delicious Food to fuel your training. A blog dedicated to Jiu Jitsu and Muay Thai and delicious Food to fuel your training. Improving your training through injury. About 12 weeks ago I had major shoulder surgery. A full and two partial tears of the rotator cuff, a dislocated AC joint, a Mumford procedure (shaving down of the collar bone to alleviate arthritis),and a small tear in the bicep and labrum. I was pretty devastated when I found out that I had to have surgery, especially when they told me the recovery time was likely 6 months. Six months without training? I almost didn’t do it. One of my concerns of course was losing my trajectory of improvement. Without regular training I feared, like a lot of people I’m sure, that I would “forget all my moves”, which in my dramatic mind basically put me back at white belt after months without rolling and sparring. But of course I had to have it fixed. And now, three months later, and half way through my recovery, I’m happy to say I have found many ways to improve my training in both Muay Thai and Jiu Jitsu and would like to share those tips with you. Disclaimer: I am by no means medically trained. Please listen to your doctors/body and use what works for you. Keep coming to the gym/dojo. One of the main values of training martial arts is community. We spend a lot of time with our training partners and they become family, don’t lost sight of the value of being around like minded people. Also there is a lot of learning to be done on the side of the mats. Takes notes, watch people roll/spar and ask yourself what you might do in various situations. Draw mind maps. Find a moderator. If you’re anything like me, the draw of the mat may be too much for you to resist. Pick some trusted friends to let you know you are being stupid. Luckily for me my husband Josh, best friend Yin and coach Andy, are around to let me know I am getting out of hand and doing too much, (and literally put me in the corner.) Even if it annoys me sometimes I know they have my best interest in mind and are essentially saving me from myself. You may be more wise than me. Trusted training partners are key. As you are able to do more and more you will rely on your team mates to accommodate you. Don’t be afraid to ask to go light. More importantly don’t be afraid to ask them to STAY light, as sometimes rolling naturally escalates. Let your partner know that you will take responsibility for protecting your injury to help ease the nervousness of being the one to reinjure you. 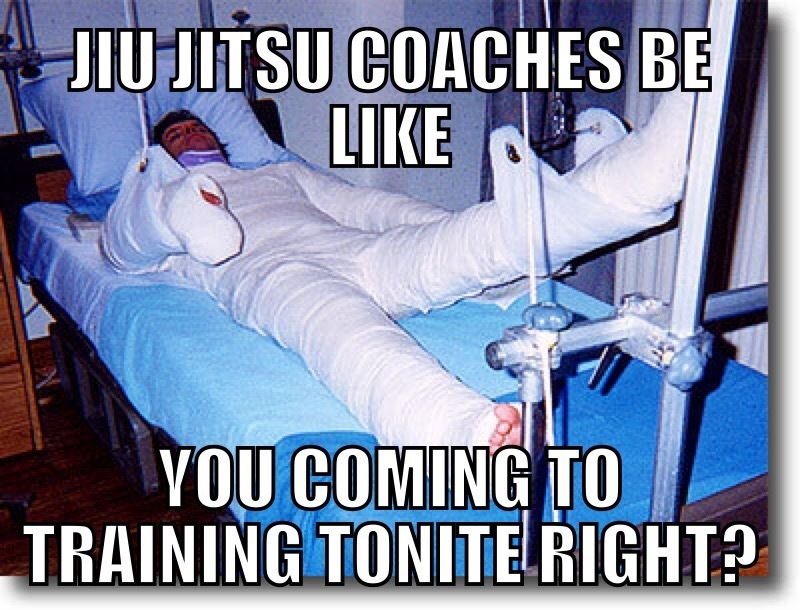 This goes for both drilling ,and if you’re able, especially sparring. Listen to your body, but push it out of its comfort zone without re-injuring yourself. You will need to trust the affected area again. Lightly trying new things during the stages of your healing will allow you to test the waters. Any pain don’t do it. But you may have options available to you and won’t know unless you try. Visualize while you’re doing other exercise. I was able to only walk initially and would use that time to imagine matches. Once I was approved for harder cardio I would use my bike sprint time to imagine doin hard body kicks repeatedly. Keeping those times we push ourselves physically in training will help you keep that intensity and push you to do your best when you may not otherwise. Having done all these things since a few weeks after surgery I have been fortunate to be able to work on games (albeit limited) that I would not normally play and see definite improvement in those areas even though I am still only able to roll and spar lightly. My A game is certainly not as sharp due to my specific injury (bottom half guard and right cross I miss you dearly) but I am starting to connect how my new skills will play a part in my game. Below I list some specific drills that I have found generally safe and fun for both myself and my partners. These are based on loss of dominate arm function. Again these drills were done with care and technique in mind. Basic foot work. Movement back and forth side to side. Front and rear foot jab. Open guard! finally allowed to lay on my back. start to roll very lightly with partners tucking my arm in my belt mostly to remind me and them. Most positions are possible with the exception of bottom half guard and being mounted. I hope this helps those of you who may be dealing with an injury. I’d love to know what kinds of drills you were able to figure out to work around your specific ailments or surgerys. Nothing makes this wife happier than my hubby requesting that I cook his birthday meal. I get bored really easily eating the same things all the time but there are a few dishes that get rotated in often. One of those things is chicken wings. But chicken wings can’t be part of healthy diet right? Well, the way I see it, it’s all in the preparation, and the moderation. Maybe don’t eat these every week. But if you’ve gone total beast mode in training and have a few calories in the bank, treat yo’self. These are not difficult recipes. Nor are the culinary genius… But they are friggin delicious. Remove wings from baking sheet using tongs and toss wings to coat in sauce. 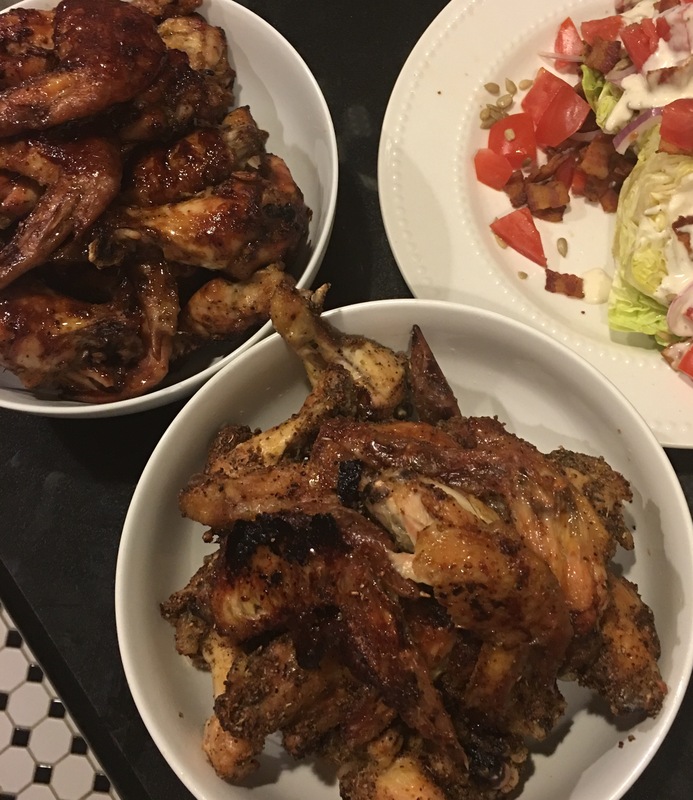 You may not need to bake 3lbs of wings at a time, but that is the average pack size I’ve come across, and keep in mind the poundage does include bones. No judgment here on how many wings you put away. Also I highly recommend Bell and Evans chicken wings. They are super tender and crispy up nicely. They aren’t paying me to say this, but I wish they were. I didn’t get a great pic, but I couldn’t make the man wait on his birthday… You guys know what wings look like anyhow. Cauliflower is the new coconut. For those of you who stay on top of healthy eating trends you may remember after the paleo craze hit, coconut became the star of the kitchen. Coconut oil, coconut flour, coconut milk… We were all nuts for coconut. Flash forward to 2015-16, the year of the Cauliflower. From Pizza crust to Alfredo sauce the Internet is filled with different ways to use it beyond the steamed with butter that we are all accustomed to. From a health perspective, it’s loaded with vitamins, very low in carbs, and has all the benefits of cruciferous veggies (see http://www.whfoods.com/genpage.php?tname=foodspice&dbid=13 ) without the usual deep flavor that comes along with them. That can make it a pretty agreeable ingredient when you are substituting or modifying recipes to lower calories or limit certain macros. What it does in this recipe is add a lot of body and creaminess without a tons of extra fat added like the traditional heavy cream or roux. I include a recipe for the crab topping, but you could eat/serve this as is! This recipe is relatively low in calories and carbs so if you’re having this on a training day, definitely supplement during training with your favorite intra-workout nutrition. I use BPI sports “best aminos” and 1 Tbl honey per hour. Sauté the bacon pieces until crispy then remove from heat. Strain the fat and reserve. Leave the bacon off to the side. Add reserved Tbl of bacon fat back to soup pot. Add chopped onion and sauté until brown. Then add red pepper flakes and stir. Add cauli, garlic, and kale to onion and stir until kale begins to wilt. Add chicken stock (or water) to cover ingredients and bring to a boil. Turn of heat and add avocado, bacon and Asiago cheese. At this point you can either use a blender to purée soup to a smooth consistency or a stick blender right into the pot. Season with salt and pepper to your satisfaction!